What’s the most expensive lift ticket out there? $70, $80, $90? Yikes! We’ll be hitting Benjis in no time. What is a family to do? Give up skiing or riding? No way… it may take a little legwork on your end, but there are deals to be had. Ski midweek – lift tickets are cheaper. Frequent skier clubs – check with your favorite mountain to see if you can get a discount for frequent visits. Look for multi-day tickets. Many resorts offer ski two out of three days; three out of five; or even four out of seven. You choose the day you want to ski. Savings can be up to half off of regular prices. Look for local promotions. Often resorts will offer lift tickets through partners such as supermarkets, gas stations, or sporting goods stores. Package deals – many resorts will bundle lift tickets with lodging. Savings are big, especially for a family deal. Many resorts offer “kids ski free” for a week long package. 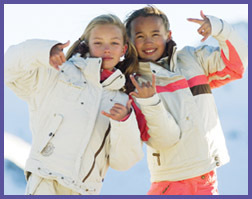 Kids ski free – many resorts offer free tickets to kids under five, seven, or even 12. CraigsList or Ebay – many people list lift tickets for sale. Buyer beware! There's always a deal out there – especially if you are willing to do a bit of checking prior to your visit. Happy trails!